Camden's baseball stadium will be torn down and replaced by fields for Rutgers University-Camden athletes and the community. CAMDEN, N.J. -- Camden's baseball stadium will be torn down and replaced by fields for Rutgers University-Camden athletes and the community, marking the end for a publicly funded stadium once heralded as a new beginning for the city waterfront. 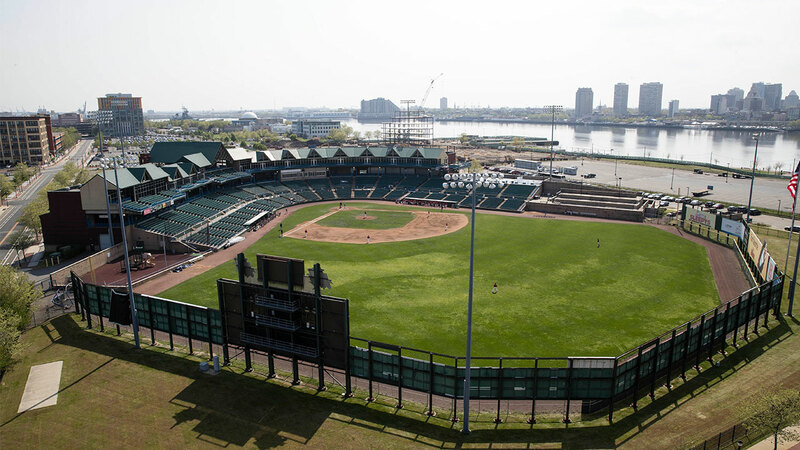 Rutgers-Camden on Thursday agreed to invest $7.5 million in the project to redevelop Campbell's Field, which sits across the Delaware River from Philadelphia. The announcement marks the end for a stadium now viewed as a waste of public money. Then-Gov. Christine Todd Whitman, a Republican, broke ground on the project in 1999 - comparing it to the film "Field of Dreams." The stadium itself was built with a complex combination of at least $21 million in bonds, loans, grants and other financing from the state Economic Development Authority, the Delaware River Port Authority, Rutgers and Santander Bank. The Campbell Soup Company, based in Camden, paid $3 million to have its name on the stadium, and the facility began to attract crowds for baseball games, concerts and other events in the shadow of the Benjamin Franklin Bridge. Despite the auspicious beginning, the project eventually defaulted on its bond payments, and the county bought it to save it from foreclosure. The stadium currently only brings in about $100,000 a year in revenue. Plans call for building athletic fields, bleachers and locker rooms for Rutgers-Camden's NCAA Division III baseball team. The university's softball, soccer, lacrosse and field hockey teams also will use the fields, along with Camden students and residents, officials said. Camden would seek state funding to help pay for the estimated $15 million project. Rutgers-Camden spokesman Mike Sepanic said he is unsure what will happen to the stadium's existing debt. There's no date for demolishing the stadium or building the new athletic facility.